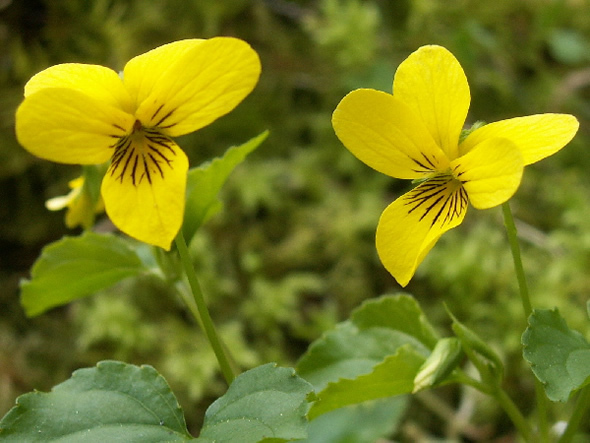 Stream Violets, Viola glabella, help us celebrate the season of rebirth. Welcome to April's issue of Whispers, the newsletter of the Dereila Nature Inn - your cyber nature centre. Many thanks to everyone for subscribing and contributing ideas and images to our project. We really appreciate your support. In this month's issue we have some new features to tell you about as well as some tips and photos we hope you'll enjoy. This month's new additions include pages featuring mammals and birds. Just click on the images to visit the page. We've added five more pages to this series featuring mammals. Everyday the Steller's Jay drops by and calls out for a treat and so here's a little photo story of what happens. Tony D. from Toronto, Ont. 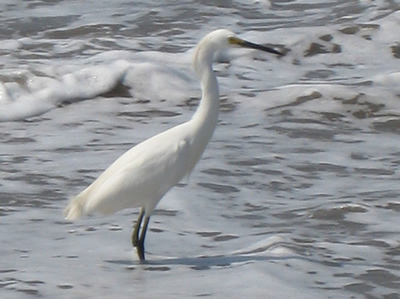 sent this picture of an Egret standing in the ocean in Mexico. 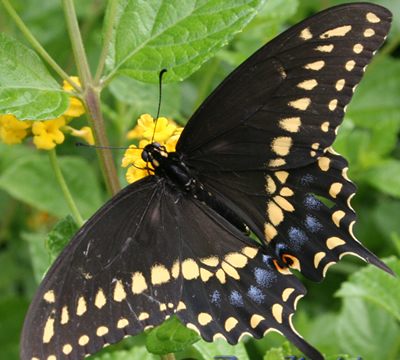 This wonderful close-up of a Black Swallowtail was sent in by Ron M. of Kenner, LA. This is the official state butterfly of Oklahoma. We want to thank Ron for also sending us an image of the Vicery butterfly which has been added to our State Insects page. This month we have captured an extraordinary plant for our wandering image. 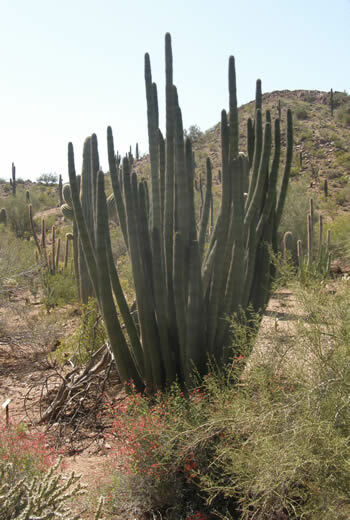 This Organ Pipe Cactus was taken in the desert just south of Phoenix, AZ. 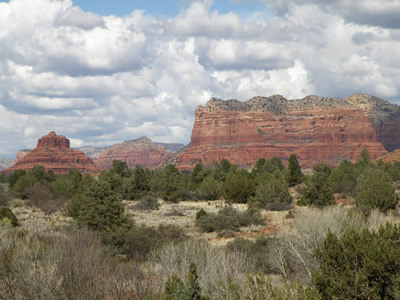 This month takes us to the area around Sedona, Arizona: the land of the Red Rocks and truly worth a visit to explore and enjoy the formations and colours. 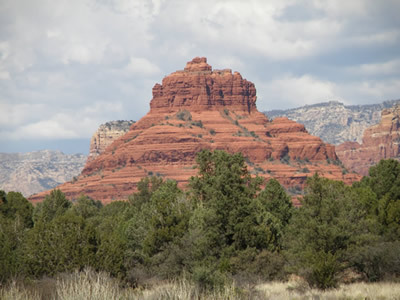 They call this formation Bell Rock. These massive mountains of red are scattered all around this beautiful region. Each month we invite you to submit a funny caption to go with one of the images in our "Caption This!" collection. 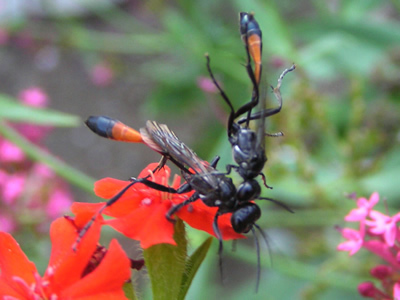 This month, two Thread-waisted Wasps seem to be in a bit of a tangle. Can you think of any humourous captions to go with this picture? We managed to come up with a couple of ideas for you. Number one: "Can you do this?" Number two: "They went at it head to head." 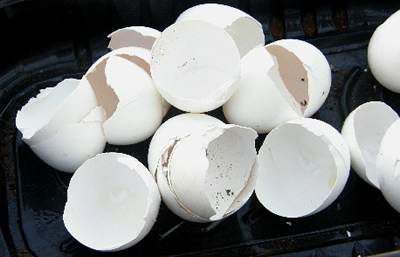 At this egg-laying time of the year birds need a little extra calcium for their egg shells and a good source of this is hen's egg shells that we usually throw away. 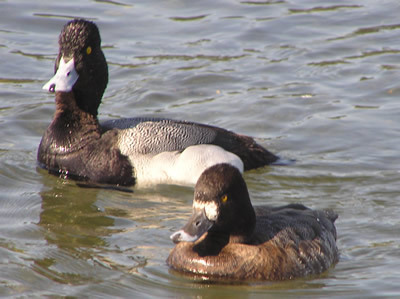 After laying their eggs, birds are also drained of calcium and will readily consume the shells you provide. Rinse your egg shells and bake them in an oven for a short time, but don't brown them. This sterilizes them and makes them brittle. Place them in a bag and roll with a rolling pin or a bottle, crushing them into bite-sized bits. Mix the crushed shells in with the food that you normally put out at your feeding station. If you prefer, you can also keep it separate and observe the birds which come to partake in this new-found luxury. 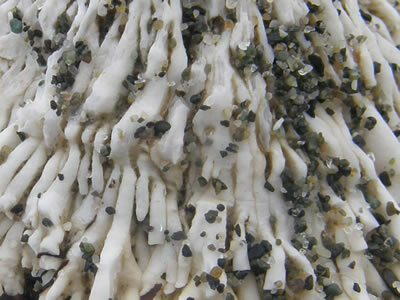 Can you figure out what this close-up is? A man walks into a bar and puts a sack on the counter and orders a beer. The sack begins to move. "What have you got in the sack?" asks the barkeeper. If I can guess how many are in the sack, can I have one? asks the bartender. If you can guess how many there are in the sack, you can have both of them, answers the man. No need to mention this, but the ducks were not too happy about this joke! We always try to be accurate in the identity and information in the newsletter and Nature inn website, but occasionally mistakes occur. Ron M. from Louisiana spotted a couple of errors in our virtual Bug Guide. This was very much appreciated and the corrections were made. Thank-you Ron for checking things out and contacting us. If you see any errors, please let us know! We are still missing a few of the wildflowers for our provincial and state wildflower page. 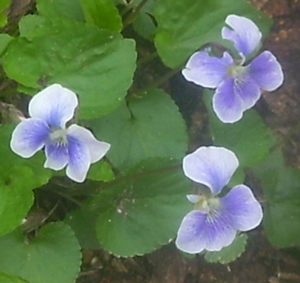 Many thanks to Susan G. who sent in this Wood Violet image, state flower of Wisconsin. Quebec is the first Canadian province or territory to adopt an official insect. They have chosen the White Admiral Butterfly. To see our page of the official state insects click here. Earth Day is April 22, and we're going to be celebrating. Watch for details coming soon. You can now add a gadget to your iGoogle homepage featuring images from our website. It's colourful, free and easy. For more information visit the Inn's Add a Google Gadget page. Pay-Pal Accepted We have had a few people inquire about donating to help with our costs. Apart from making a purchase through amazon.ca or amazon.com (see above) you can help out by making a credit card donation through Pay Pal. Just click on the Pay Pal logo on the main home page or site map. Thanks again for your support! Our next issue will be in your inbox during the first week of May! 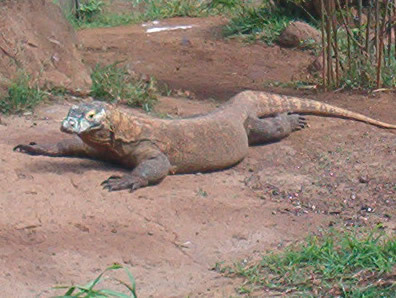 The biggest lizard is the dragon-like monitor lizard. It can reach over 4 m in length and weigh 250 lbs. 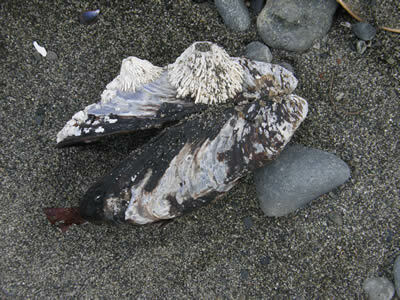 The image was a very close close-up of a Thatched Barnacle, shown here attached to a mussel.